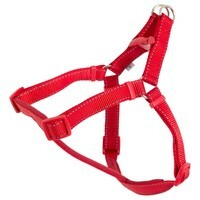 Made from a soft polyester nylon and fitted with simple clips for easy fastening, the harness also has a large solid D ring located towards the base of the neck for lead attachment. Reflective stitching has been sewn into the nylon webbing for additional safety when walking your dog in dim or dark conditions. To ensure a correct fit simply measure the dog from behind the front legs, around the chest and over the shoulders. Allow approximately 3cm for a comfortable fit. Love this - easy to fit, robust, i've had mine 2 years and it is used daily and it is not showing any signs of wear. I bought this a couple of weeks ago for my puller of a Jack Russell! Have to say that I am really disappointed with it because it doesn't stop him pulling at all but more importantly it has rubbed the top one of his legs red raw. The trouble is (if you look at the picture) it fits far too closely between the top of the leg and the body and as the material is fairly stiff it rubs as he walks. Would have sent it back but have tried to get it to stop rubbing by adjusting the sizing using the buckles and you only find out it is still rubbing when you get back from your walk - hence mine is now mud and red and I don't think you'd accept it as a return! !